Once you’ve signed the lease or contract on a new home, the next step is moving your stuff in and making the place your own. 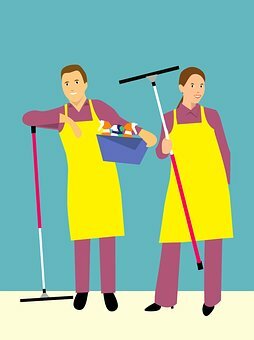 However, don’t overlook this opportunity to do a thorough, top-to-bottom cleaning before all the furniture and appliances are situated, and you can easily get into all the nooks and crannies that get filthy so quickly. Here are a few cost-conscious tips for giving the place a good deep clean before settling in. The bathroom probably contains the highest concentration of germs and bacteria, so focus on the toilet, bathtub or shower, and sink, places where germs and bacteria are most prevalent. One of the surest and most budget-friendly ways to get rid of bacteria is to replace toilet seats — they don’t cost much (you can find them for around $30) and they’re easy to install. Don’t forget to clean behind the toilet and on the floor around it using a baking soda-vinegar-water mixture, which will save you the cost of expensive cleaning fluids. If possible, clean behind the vanity as well, and replace the shower curtain if one has been left behind, a budget-friendly improvement that should only run you about $10 to $20 at retailers such as Walmart. If you find one that’s a little out of your price range, use a Walmart promo code to knock that price down a bit so you can keep it under budget. The kitchen is usually a close second to the bathroom when it comes to germs and bacteria. Your predecessors may have cleaned out the refrigerator drawers, but years of accumulated grease and grime may remain behind the stove and underneath the fridge. Try a mixture of Clorox, dish soap, and a few ounces of warm water for quick and inexpensive cleaning. Don’t forget to wipe the dust off the coils behind the fridge and spray down the pan underneath, which may contain moisture that gives bacteria a chance to grow and thrive. The combination of hair and grease that builds up in appliance parts and grates contains allergens that threaten your family’s health. Remove all the parts on the stove and soak them in a large container of hot water and soap. Hopefully, the oven has a self-cleaning feature (most of them do these days) but it will still be necessary to clean away residual grease build-up inside and on top of the unit. Pull the fridge and stove away from the wall so you can clean behind them using baking soda and hot water. Use bleach as needed, though sparingly. Carpeting is a haven for allergens and household pollutants, so give the floors a good vacuuming and shampooing before moving in. For a budget-friendly cleaning, rent a steam cleaner and do the job yourself instead of hiring a professional cleaner. Use your vacuum’s attachments to get up any accumulated hair and debris in and around air vents and returns. An old mattress is a perfect home for bacteria, dust mites and other microscopic life that can make you sick and impact your ability to get a good night’s rest. Replace any mattress that’s at least five years old, especially if you’re bringing it into a new home. Light fixtures and ceiling fans often contain built-up dust and insect remains and are home to allergens, so clean any hanging lighting, recessed lighting, and fan blades. It’s an effective and inexpensive way to reduce household allergens. Note that it may be necessary to disassemble some light fixtures in order to clean them thoroughly. Clean air is essential for healthy living, especially for individuals with respiratory issues. You can limit the impact of airborne pollutants inexpensively by washing down the walls and repainting. If the previous resident smoked, it’s also important to give the carpeting a good cleaning. Invest in an air purifier to improve indoor air quality and reduce allergens. Don’t wait until you’re moved in to give your new home a good cleaning. It may not be what you had in mind when you envisioned moving into a new home, but rest easy knowing that you’ve created a safe and healthy living environment on a budget.